Video provided by the NBL. 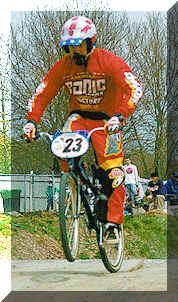 NJBMX Tracks are all affiliates of the NBL. You've probably ridden your bike for some time -- but NOW you want to RACE! Most likely you've been cruising' around the neighborhood rompin' and stompin' with your buddies and racing on homemade tracks in the backyard. Well, believe it or not, that's exactly how BMX got started. Soon along came sanctioning bodies like the National Bicycle Leagues and backyard racing became an exciting competitive sport on a local, National and even an international level. BMX is like no other sport you have tried. There are no bench sitters and every rider gets an equal opportunity to compete for the daily trophies and ribbons. From the starting gate to the finish line, you are only limited by your own abilities. YOU CAN BE A STAR!! Every major sporting event is officially sanctioned by a recognized organization and BMX is no exception. 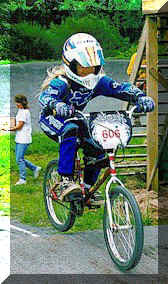 Hunterdon County BMX, Egg Harbor Township BMX, Central Jersey BMX and Mullica Hill BMX are all affiliated with the National Bicycle League. You will receive a membership card and NBL number. With this number, we tabulate and post the points you earn at ANY of our tracks throughout the United States and parts of Canada. That way, you can compete in Local, State and National events and will be eligible for year end awards on local, state and national levels. You will also receive a yearly subscription to NBL's newspaper Bicycle's Today which is loaded with pictures and stories of big races, news from states as well as local tracks, and of course, the points standings of all NBL members. Who Can Be a BMX 'er? 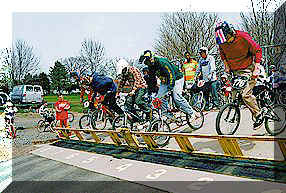 If you are old enough to pedal a bike, you can race BMX!!! This sport is for boys and girls, thru the 50 and Over Cruiser Class which is really catching on with the Moms, Dads and Grand Parents! Any bicycle with wheels that are a maximum of 20" may be used. Crossbars and handlebars must be padded, as well as the frame and gooseneck. In addition, the handlebars must have handgrips. If your bike has a kickstand, a chain guard, reflectors or other gadgets, you'll want to remove them. Freestyle type bikes with bolt-on or permanent standing devices are not allowed. All of these requirements simply add to the safety of BMX. Want More Pictures? Go to the Photo Gallery !! !